We were in between one our meetings when suddenly the idea struck me. After all we are trying to solve problems of today, while keeping scalability for the future in mind. The exercise was being carried out to better understand trends and practices in the future. What’s the best way to predict the future ? Like my partner Sumit says, “the best way to predict the future is to invent it,” and we were looking for inspiration for our invention. That’s when we started making observations on the history and evolution of society. Man has come a long way, we started out as hunter gatherers and have now reached a post industrial era of digital assets and transactions. What really gathered our attention was the evolution of society and politics with the use of different forms of money. While we started out with exchanging goods and services under a barter economy, polity was limited to the scope of individuals or smaller groups.These groups increased in size and became semi settled and stopped moving around as often as hunter gatherers. The new form of Money was now Commodity Money?—?issued by the newly formed political organisations within such groups. What’s really interesting to observe is the impact that these different forms of Money had over the evolution of politics and it’s different forms. While commodity money sped up the settlement process , it had its own limitations when put to use for larger groups. Enter, money in the form of metallic objects or better known as Coin Money. Historians believe that the first use of coin money began as early as 5000 BC. It’s no wonder that the first signs of formal and organised government only started cropping out after that when Sargon the Great (who ruled 2334–2279 BCE) unified Mesopotamia under the rule of his Akkadian Empire and set the standard for future forms of government in Mesopotamia. Whether it was evolution of money which pushed for the evolution of polity or the other way around is an inconclusive debate, what is for certain is that there is a significant correlation between the evolution of the two: money and Polity. Coin money had its own limitations especially when it came to uniformity of weight and purity of precious metals which finally resulted in the State to not only take up this activity but make it one of its main functions. Coin Money issued by different states starting representing the different polities. Greater rise in commerce required a more convenient form of money. It was difficult to carry around excessive weights of gold or silver and hence, paper money was introduced. The very idea stemmed from goldsmiths who would often issue bills of receipt to people for their deposits of gold and these bills could be exchanged for gold at a later date.This was a significant stimulus to the introduction of paper currency as it implied that the money represented an equivalent amount of gold or silver that existed somewhere else. The 20th Century witnessed interesting developments in the sphere of both- Polity and Money. While the world witnessed an unprecedented rise of republicanism resulting in sovereign states beginning to gain independence from its foreign rulers, its around the same time, later in the century, that the United States decided to move away from Gold Backed Paper currency to what would be now known as Fiat Currency. Fiat Currency is legal tender whose value is backed by the government that issued it and this became the norm as we entered the 21st Century. Technology gave way for its use in the form of Bank money or plastic money, however the basic principle of it being backed by a national government remained the same. Again to define whether it was a change in polity and its status that fuelled the change to fiat currency or the other way around is a difficult task, but a clear correlation can be observed between the two. While the rationale for change to fiat currency was economic stability, many argue that the intention was getting more power. Independent countries have been forwarding their agendas with a greater force now more than ever, especially with a greater control over money. History suggests that the life cycle of fiat currency has always ended in its failure. The Romans were the first to begin its use as early as the 1st Century which ended with its eventual devaluation and collapse, so much so that it has also always ended with the collapse of the economy housing the same fiat currency. “The Times 03/Jan/2009 Chancellor on brink of second bailout for banks.” It refers to the headline of a Times article about the UK’s attempt to prop up its economy. What Satoshi Nakamoto had done is in essence given the people a new form of currency, crypto currency, a currency that was free from all of the limitations of its predecessors. For the first time ever there was a currency that was uniform, durable, portable, divisible and acceptable. In fact it went the extra mile to make it free from the control of governments running nation states or countries as we know of it. The world is increasingly becoming a smaller place, the internet has already impacted communication by making it easier and quicker leading to the concept of a global village. Bitcoin has now bought about a similar shift when it comes to transactions and exchange of value. Are we steadily moving to a more unified concept of a global polity ? Will countries as we know of it stop existing? 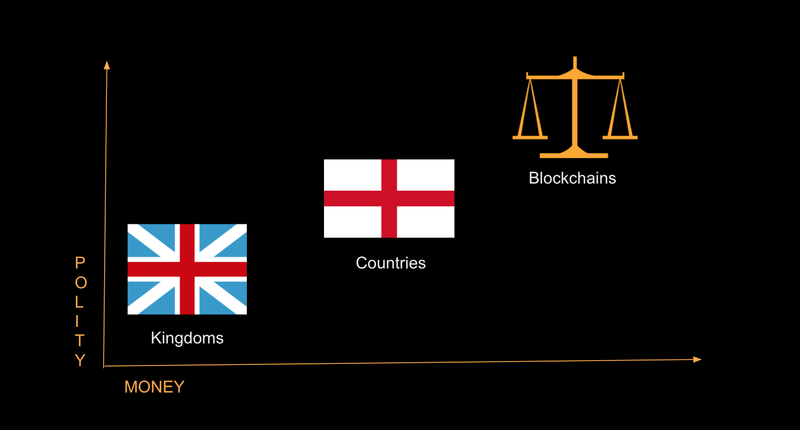 Will we finally see a decentralised world ? Do share your views by commenting below.